The Truck Stop is a new venture from Street Feast and Tweat Up. 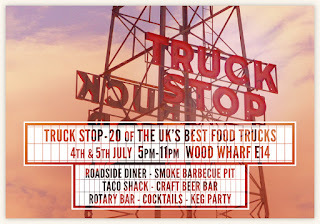 For six evenings - the first Thursday & Friday of July, August & September - they're taking over the park at Wood Wharf, near to Canary Wharf, for the largest collection of food trucks ever assembled in London (update - September will be in a different venue). You pay £10 in advance to get in, and this gives you tokens that you can spend in the event. There will also be guest chefs cooking at a special roadside diner, and lots more besides. Bring it on! "The Truck Stop convoy rolls in to town over six nights in the summer and will feature the largest collection of food trucks ever assembled in London. Find us at Wood Wharf E14 on the first Thursday and Friday of July, August, and September. Alongside the UK’s best food trucks, there will be a craft beer bar, a roadside diner (with guest chefs cooking supper club set menus), a Camden Town Brewery keg party with a Rotary Smoke barbecue pit, a taco shack, a ‘secret’ Boodles Gin Bar and the Rotary cocktail bar; all packed onto the waterfront at Wood Wharf with live music and tons of seating and eating. 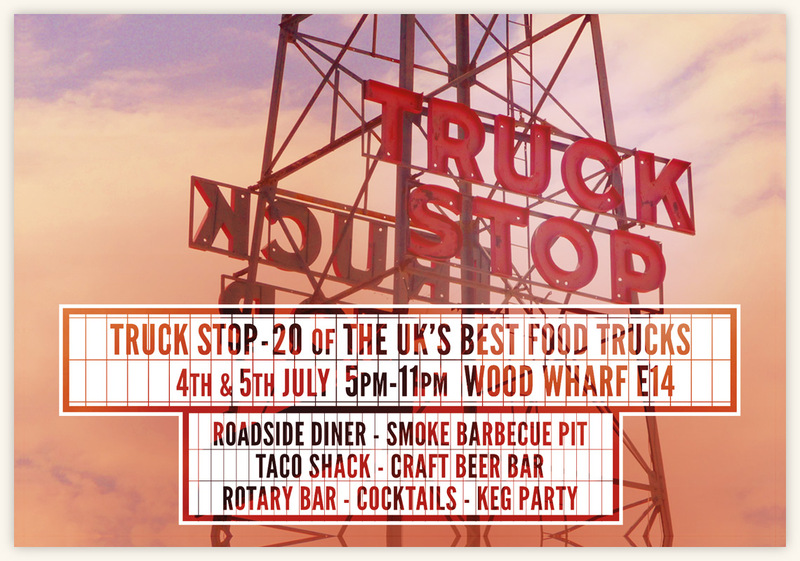 Tickets for Truck Stop are £10 and include 10 Truck Stop dollars to spend at the Rotary Cocktail Bar or the Craft Beer Bar." I went to Truck Stop last Thursday and was pretty unimpressed. I hadn't booked ahead of time and upon arrival I was told wouldn't get the 10 GBP worth of drink vouchers because I didn't book in advance (at the time it didn't say anything about this on the website, now it does). As I had already made the long journey to Canary Wharf, I paid my 10 pounds to get in, where I then had to pay extra for food and drink. There was no live music or entertainment to make it worth the entry fee. The queues for food were pretty long, taking about 45 minutes to and hour for some vendors. The one stand I wanted to try was Yum Bun and it wasn't even there. I emailed the sponsor after the event to ask about the entry fee and have not gotten a response. Many of these street vendors also sell food elsewhere in London and you don't have to pay an entry fee. I don't think it was worth the journey or the cost.